One of the things I do to find food inspiration is to go to Whole Foods Market’s produce section. It’s big, brightly lit, and full of the most perfect and beautiful fruits and vegetables. The prices can be a bit steep, but I love perusing its aisles looking for interesting ingredients. There is always one aisle that has something different, at least to me. Over the last year, I’ve found red currants, gooseberries, passionfruit, and other items not commonly found in Southern California grocery stores. And, did I mention that I have a crush on one of the produce guys there? I’m there often enough that he recognizes me and we’ve developed a cook/produce guy relationship. (This is the part of the story where I tell you he looks about 20 years old and is totally cute in a surfer dude kind of way.) We chat about my cooking plans, and he points out things he thinks might be interesting to me. I was standing in front of some apricots when he appeared next to me, smelling faintly of oranges, and asked, “Hey, whatcha making with those?” I was a bit startled, and managed to stammer something completely inaudible. “A pie or tart, or something,” I repeated. “Well, you gotta try these.” He takes out a small paring knife and deftly cuts a slice of juicy golden flesh from a black velvet apricot. “It’s really sweet and juicy.” I nod enthusiastically, like a little giddy school girl, not really understanding what he’s saying to me as I’m mesmerized by his dazzling smile. “Yeah, really good. Really good.” He picks the ripest ones as I reach for a bag to put my latest discovery. “See you next time,” I say as I push my cart down to the meat department, a bit flustered. As it turns out surfer dude/produce guy was right. They were really sweet and delicious. Like plumcots, plouts, and apriums, they are a hybrid of plums and apricots. Black velvet apricot, made of 50% plums and 50% apricots, is just a more appealing and enticing name for plumcots. Plouts are 75% plum and 25% apricots, while apriums, are the opposite, 75% apricots and 25% plums. Black velvet plums have a short season, so run down to the Whole Foods near you before they disappear. 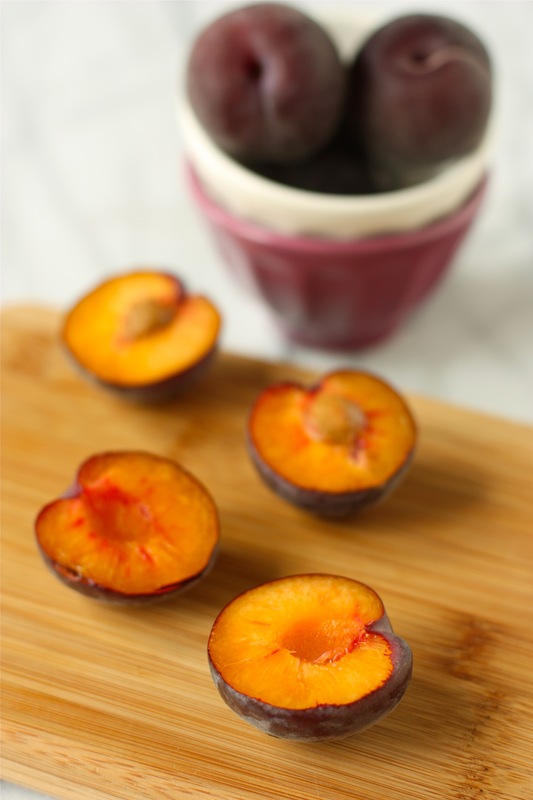 Black velvet apricots have the best of both worlds – on the outside it has the deep purple, almost black color of plum, but without the sharp, pucker-inducing taste of its skin. Its interior has the beautiful bright, orange-yellow hue of apricots, but it is juicier, firmer, and has a longer shelf life like a plum. Don’t let their smaller size fool you, as these gems are packed with a super sweet, intense flavor. 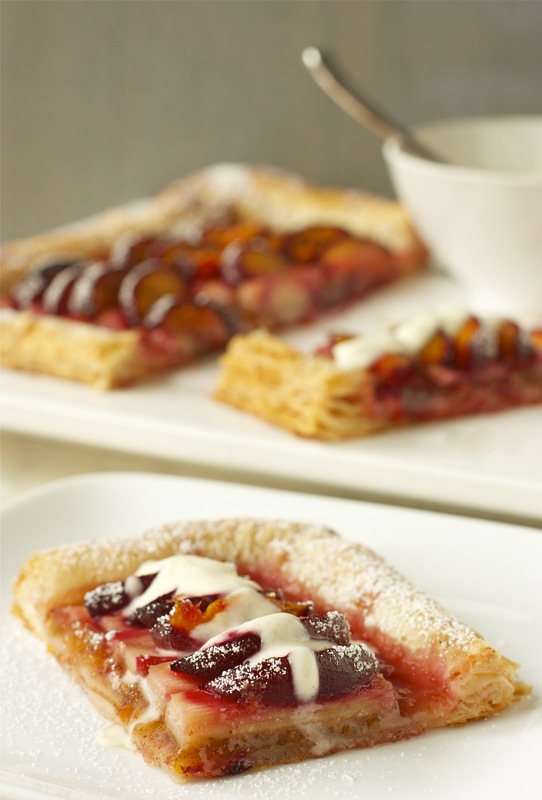 Combined with the tangy flavor of another seasonal ingredient, rhubarb, this tart is a real winner! Mix the crème fraîche, sugar and cardamom in a medium bowl until smooth. Cover with plastic wrap and refrigerate for at least one hour. In a small bowl, combine the apricots, the other 2 tablespoons sugar, allspice, and Grand Marnier and mix well. Set aside. Carefully unfold thawed puff pastry sheet and place on the prepared baking sheet. Using a fork, lightly score a border about 1 inch from the edge. Cover with a plastic film and chill in the refrigerator until ready to assemble the tart. To make the almond crumble, mix together the almond meal, brown sugar, vanilla bean seeds or paste, and cinnamon. Take the dough out of the refrigerator. Spread apricot jam in the center of the dough, leaving the border intact. Sprinkle almond crumble on top of the jam. 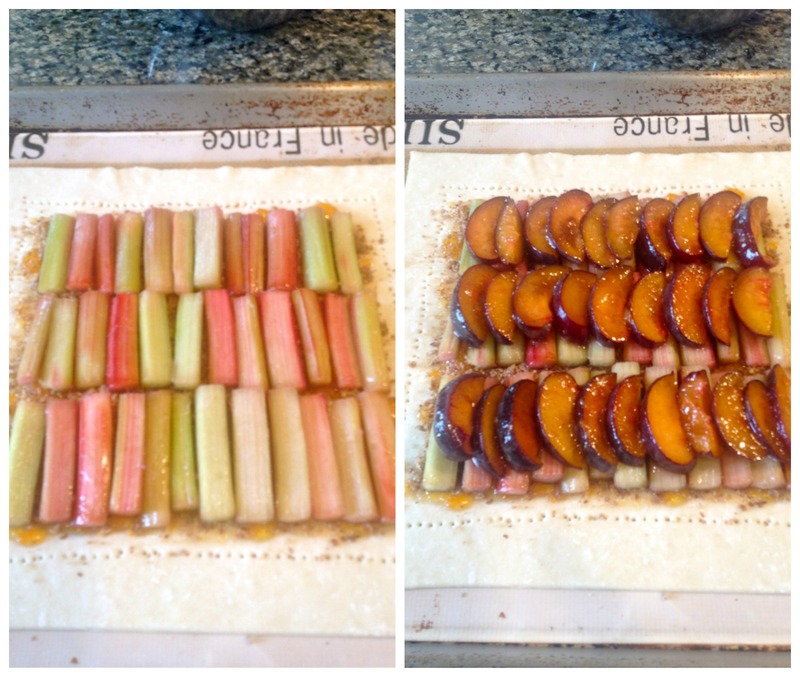 Arrange the pieces of rhubarb and then apricot on top. 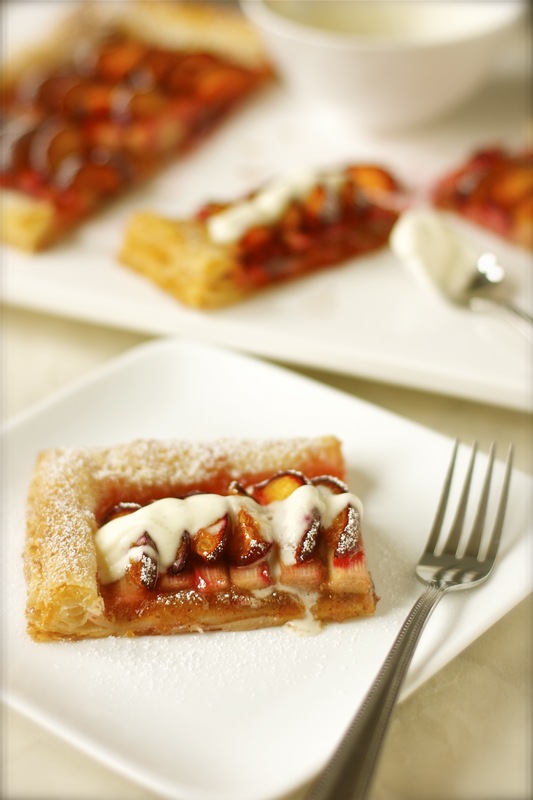 Bake until puff pastry is golden and fruit is soft, about 15 to 20 minutes. Remove and sprinkle with powdered sugar and a dollop of Cardamom Crème Fraîche. Look delicious but delicate fruit dessert! Great post Daisy! Your tart is so beautiful. A work of art in your assembly. Perhaps inspired (slightly) from the handsome produce guy? this looks absolutely delishes! I can’t wait to try it out! Thanks, Melanie! I hope you do. Hurry if you want some black velvet apricots, otherwise, use regular apricots. I hope you enjoy them as much as I did. There are so many things you can get in England that I can only dream about here….real clotted cream, for one. Hopefully, you can visit California and stock up on the stuff we have here. Wow! They look just incredible. Those flavors are perfect. Thanks for this! Hi, Sarah! Thanks. I did get this one right. The flavors work well together. Gotta rush out and get more black velvets before the season is over. Now you need to pack up a nice slice of this delicious tart, take a deep breath and march right back into the grocery store and deliver to the cute produce guy! I dare ya’! Ohhh, no! Don’t have the guts for that….I can only watch and stammer from afar…. I’ve never heard of a black velvet apricot before! They sound incredible. I can get pluots at my local farmer’s market, though, so maybe I should try a tart with those? Oooh, yes! I’m sure plouts or just regular apricots would do nicely. Now, I’ll be on the lookout for them at the farmers markets. Thanks, Patti, my fellow gourmande! Hahaha! Quit staring at it and get to making it already! Yes, this combo would make a great jam. I’ve never made jam before, so this might be the push I need. Do you have a recipe? Thanks for that lovely suggestion. Hi Daisy–I think any recipe would do, might be particularly interesting if you add some grand marnier or something along those lines. I have some jams and jellies on my recipe page. One of the interesting ones that could translate/riff would be the blueberry compote with brandy. I’m thinking the plum-rhubarb with something herbal and something other than brandy. Not sure if I would like brandy with rhubarb, but maybe it would work. I’m sure it’s easy to find your very own produce guy in Seattle, perhaps smelling boldly of coffee? Or grungily of stale beer? Aaah, yes! That’s more like it.